Stockholm, 1968. A thousand American deserters and draft-resisters are arriving to escape the war in Vietnam. They’re young, they’re radical, and they want to start a revolution. The Swedes treat them like pop stars – but the CIA is determined to stop all that. It’s a job for the deep-cover men of Operation Chaos and their allies – agents who know how to infiltrate organizations and destroy them from inside. Within months, the GIs have turned their fire on one another, and the group dissolves into interrogations and recriminations. When Matthew Sweet began investigating this story, he thought the madness was over. He was wrong. Instead, he became the confidant of an eccentric and traumatized group of survivors – each with his own intricate theory about the traitors in their midst. All Sweet has to do is discover the truth . . . and stay sane. I'm a big fan of Matthew Sweet's work prior to this book so I my expectations were high. Plus prior to publication, the subject matter seemed so interesting that I was pretty sure I was going to like this book. And I was right. It's bloody marvellous. It's sub-title - 'The Vietnam Deserters Who Fought the CIA, the Brainwashers, and Themselves' - tells you the basics about what this book is about. 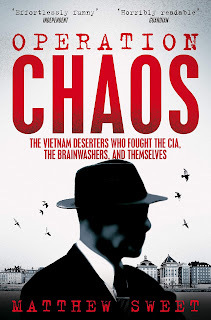 It is the story of men who deserted from the American armed forces over Vietnam. * Then it is the story of the bizarre and dark paths their stories take. Not all of them escape those dark paths. Some of them do though. This is a tale of politics and paranoia. People are drawn into groups, fall out of groups and fight each other verbally and - occasionally - physically. People find leaders to follow so of whom seem more batshit crazy than others. I'd never heard of Lyndon LaRouche until I read this book. There's a man who seems to have his head screwed on entirely the wrong way around. It's LaRouche who is the villain of this book. He is Donald Trump crossed with David Icke, although there is something dark and ugly about his approach to people and politics. Orwell talked in 1984 about double-think. LaRouche and his acolytes appear to be able to treble and quadruple think. Believing in the basest nonsense. Indirectly this book did one thing. It made me question how I've come to believe what I have come to believe and whether I too have become part of a cult that doesn't have a name or a leader but allows me to accept a truth that I am comfortable with. Perhaps we should question more but when we start making up answers based on what we would like to be true rather than what is true then we are lost. Modern politics seems to have taken on a distinctly LaRouchian spin. A fact is no longer a fact but our feelings about that fact. There are some good people in here though who got lost (or were made lost) and sometimes came back. Read it. It's brilliant. *This motivation seems less strong in some of the deserters than others.